Recorded in 13-15 February 2001, 17 February 2000, 15 November 2000 and 1 March 1999 at the Fitzalan Chapel, Arundel Castle. This is the eighth release in the projected complete works of William Byrd under the aegis of ASV. One remembers the "birth" of renaissance singing with the emergence of the Deller Consort in the mid-1950s and the amazement, indeed furore, that the sound of a counter-tenor voice produced. We now take this for granted in the short time of 50 years; even more than this, we have emerging a talent and expertise in English renaissance which is envied; and rightly so. The number of groups which have succeeded in bringing alive one of the best periods of our national music has increased, together with the quality and understanding of the genre. 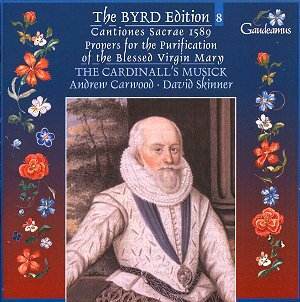 The Cardinall�s Musick are to the forefront in the interpretation of the Tudor period. Their performances of the music of Fayrfax and Ludford has been rightly praised and lauded. In this series of the works of Byrd, they continue with excellent production as in previous volumes, and, as before, embellish the result with scholarly research by Andrew Carwood and David Skinner. Skinner is responsible for the booklet. Here we have singing of the highest standard, with a good understanding of how the latin Masses would have sounded. The interesting thing is the contrast between various items. Judge the rapid speeds of Vigilate and Laetetur caeli with the slower more solemn pace of the other pieces. This is another group, like the Chapelle du Roi who use one voice to a part, with the resultant improvement in clarity of diction. Admittedly this is at the expense of the utmost in smoothness, but I think it gives the music more bite. Throughout the series, the intonation has been nigh perfect, with nicely graduated alterations in dynamics, and as I mentioned before, excellent diction.